The opening is months sooner than expected for some time — but still three years later than the original goal to finish the massive tunnel under downtown by the end of 2015. The Highway 99 tunnel could be ready for Seattle traffic by fall, according to a schedule update by contractors and the state. The builders’ forecast of Oct. 25 to finish construction and testing has been accelerated to Aug. 14, on a new Seattle Tunnel Partners (STP) schedule chart released Wednesday by the Washington State Department of Transportation (WSDOT). 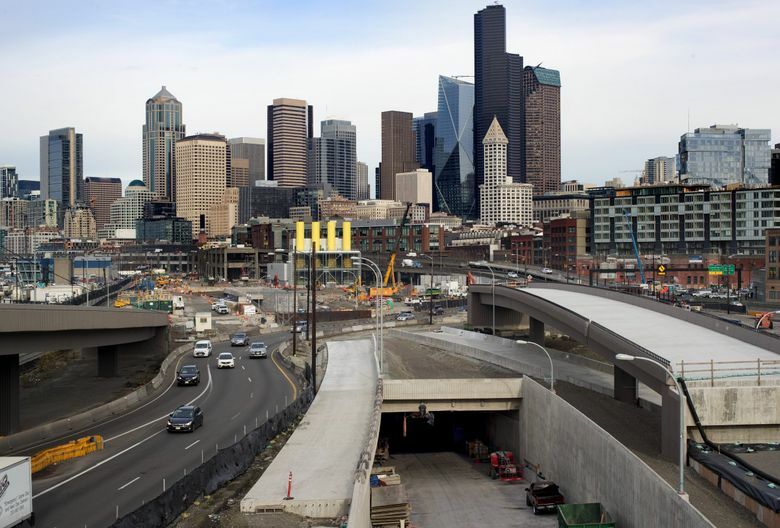 However, the state needs an additional three to five weeks to connect ramps at the Sodo and South Lake Union entrances, resulting in a prospective fall grand opening for the $2.2 billion tunnel. Assuming an August finish, the WSDOT hasn’t yet determined how soon it will take over and start the ramps, said spokeswoman Laura Newborn. The timing must be coordinated with I-5 lane resurfacing, and other roadwork that affects late summer mobility. 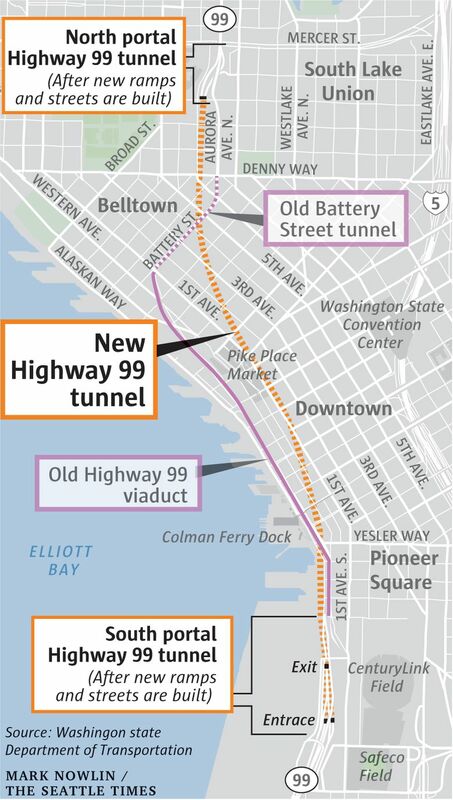 A fall tunnel startup is sooner than the January 2019 date that’s been discussed for many months by the project team — but it’s almost three years beyond the original WSDOT goal to finish by the end of 2015. After a breakdown of 58-foot-wide tunnel-boring machine Bertha, followed by an unprecedented lift and repair operation, the job picked up steam. Bertha restarted two years ago and dug rapidly after passing beneath the Alaskan Way Viaduct at Yesler Way. Construction of tunnel decks has accelerated within the concrete tube since Bertha reached daylight last April. The lower, northbound roadway, assembled from concrete decks cast in Tacoma, is two-thirds done. As of Wednesday, all the decks that can be trucked into the tube at Sodo have arrived, said Newborn. The remainder will be trucked and installed from the north portal at South Lake Union. The upper, southbound roadway, whose concrete is poured and molded inside the tunnel, has been fully built. Once the double-deck tunnel, utilities and signals are ready, the Alaskan Way Viaduct will be permanently closed — but the tunnel bypassing downtown won’t be ready yet, causing severe traffic congestion. Traffic will take either I-5 or navigate crowded city streets until the tunnel opens. In addition, a week before the viaduct closes, the southbound viaduct exit at Sodo will close. And for a week after the tunnel opens, the new northbound exit to South Dearborn Street at Sodo will still be under construction. As the tunnel takes shape, the risk of further cost overruns decreases. The state’s project team received a $60 million advance from the Legislature, with a worst-case scenario of needing $149 million to cover WSDOT’s additional administration and engineering costs caused by the delay. Finishing the project this fall ought to keep the cost down, to a yet-unknown level, Newborn said. Lawsuit claims by tunnel contractors STP of up to $600 million for Bertha’s repair and delay costs pose an additional taxpayer risk, which the state is aggressively resisting. In the latest court hearing, Judge Carol Murphy in Thurston County Superior Court ruled Dec. 15 that STP’s arguments deserve to be heard about whether WSDOT sufficiently notified contractors about a buried steel pipe that Bertha hit. STP blamed the pipe strike for damaging Bertha’s cutter drive. Murphy declined the state’s request for a quick ruling in WSDOT’s favor. If the tunnel opens in November, that complicates the dance of downtown projects known as “One Center City,” requiring commuters to detour, disrupt or defer their habitual trips. Drivers would lose the viaduct’s Western Avenue exit and Elliott Avenue entrance weeks sooner, and quite possibly before First Avenue is ready to absorb some detour traffic in 2019. First Avenue is being rebuilt to take a streetcar line. “We will be in active discussion with all our partner agencies,” Newborn said. Another looming question is whether viaduct demolition, now planned for early 2019, would be accelerated, bringing the pain sooner for drivers who must transition from the viaduct to surface streets or the tunnel. On the other hand, a November start means that motorists, delivery trucks and private transit between Aurora Avenue North and Sea-Tac could bypass Seattle’s clogged downtown core on a faster corridor this year.